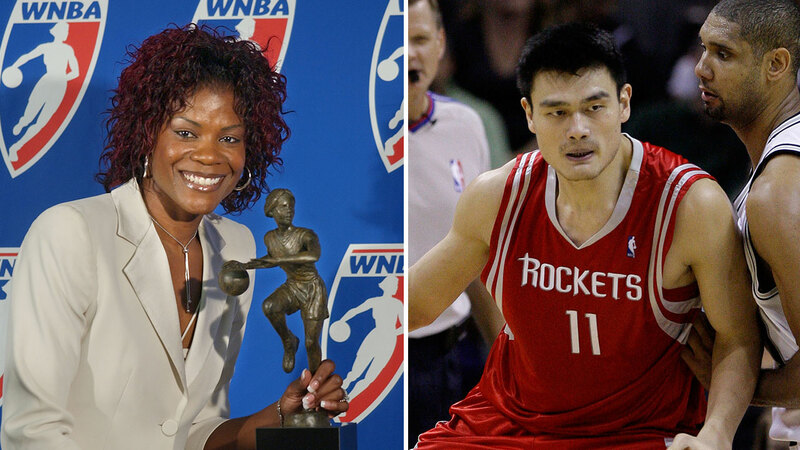 Two titans of Houston basketball, Yao Ming and Sheryl Swoopes, are now in the Basketball Hall of Fame. ESPN reports Ming and Swoopes will be joined by Shaquille O'Neal, Allen Iverson, Michigan State coach Tom Izzo, and Chicago Bulls owner Jerry Reinsdorf in the 2016 class. Longtime NBA referee Darrell Garretson, coach John McLendon and former stars Zelmo Beaty and Cumberland Posey will be enshrined posthumously. Ming, the No. 1 overall pick by the Rockets in 2002, didn't have the numbers of some other great centers, but he bridged a path for the NBA to China. The third Chinese player in league history was an eight-time All-Star before injuries shortened his career, as he missed 159 out of a possible 164 games in the last two years in the NBA. Ming was a first-team all-rookie in the 2002-03 season. In his first game against O'Neal, he blocked his first three shot attempts in the first three minutes of the game. Swoopes was the first player signed by the WNBA. She went on to win three MVP awards and four championships in the league, but it was her 47-point performance in leading Texas Tech to the 1993 NCAA championship that many think of first when talking about one of the greats of women's basketball.